Homepage. This page: Photo showing a preserved ERA at Shelsley. ERA Books Whether for the E-Type as shown below, or any other type of ERA, it is worth having a look on Amazon for books, DVDs, Videos etc. Have you seen today's eBay auction listings for the ERA E-Type? 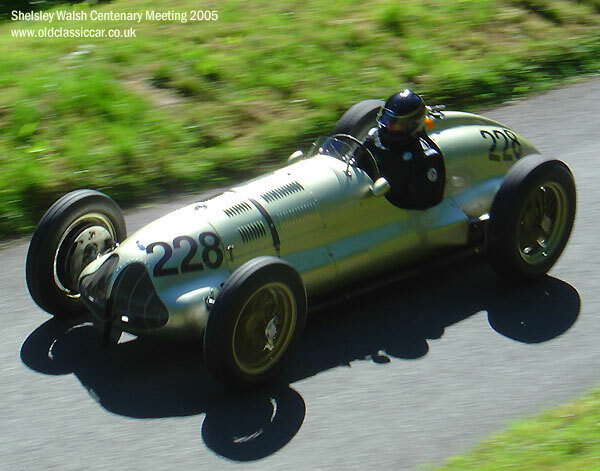 Photograph taken at the Shelsley Walsh Centenary Meeting Aug 2005 run by the Midland Automobile Club. The E-Type ERA looks very similar to the pre-war Mercedes GP cars and itself dates to 1938. Power comes from a supercharged 1988cc engine fitted with a Zoller supercharger when new. I'm the first to admit that my knowledge on such vehicles often leaves a lot to be desired, so if you have some interesting facts that could be added in with this ERA photograph, or have specific stories relating to this E-Type then please contact me via the oldclassiccar Contact page. This is one of 86 photographs that I took during my day at Shelsley Walsh, the others can be found on the Shelsley Walsh Centenary page.